Let’s face it: Finding the perfect diaper bag can be a challenge! You want it to be comfortable enough to carry around but big enough to hold all the necessary items: diapers, wipes, bottles, extra clothes, toys, and the list goes on and on. We’re going to narrow down the choices and put the spotlight on some of the best backpack diaper bags on the market. Bags that we believe are the best for travel, twins, multiple children, and even the best backpack diaper bags for cloth diaper users. Read on to find the perfect backpack diaper bag for you. What is a Backpack Diaper Bag? Most backpack diaper bags look similar to the regular backpacks you see in travel stores or back to school sales. The difference is that those designed as diaper bags have some extra pockets to hold all the items babies need, like diapers, creams, wipes, and changing pads. Many also include a changing pad with its own designated pocket. Some even have insulated pockets to keep bottles nice and cool. These bags are designed for moms and dads who need free hands while still carrying everything their baby may need while away from home. A busy parent frequently has their hands literally full. When a child is an infant, they have a baby carrier to lug around. When the baby is a little older there are strollers to push and toddlers begging to be carried. Add in siblings, groceries, trips to the library, and overnight stays at grandma’s, and it becomes obvious that your choice in a diaper bag seriously matters. The biggest selling point for using a backpack diaper bag is that it allows your hands to be free while you deal with more important matters like dropped binkies and runny noses. Take it from us: One less thing to carry makes a big difference! Backpack diaper bags also cause much less stress on your back than a bag that is worn on just one shoulder. It’s a pretty big deal when you consider the amount of time you will spend lugging that bag around. Believe it or not, backpack diaper bags aren’t one-size-fits-all or one-style-fits-all. You’ve got choices! Colors, patterns, and styles are all important but the factor that will keep you from trading in your bags like a revolving door is the ease of use. If it is a hassle to use, you’ll soon be shopping for another one. Backpack diaper bags come in different sizes and shapes. Some are better for handling things for one child, while others are better choices for a family with more than one child. Another consideration is how much you travel. If you travel regularly with your kiddos, you may want to choose a different backpack diaper bag that’s more suited to travel as opposed to your everyday bag. What about cloth diaper users? 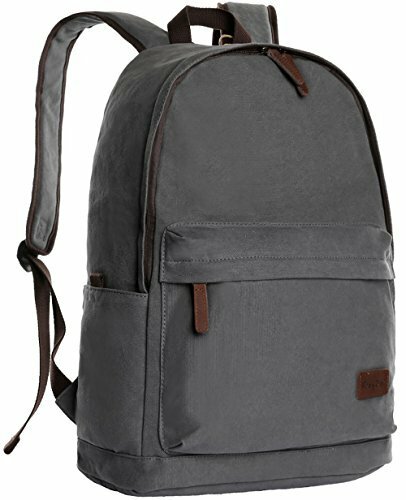 Are there backpack diaper bags better suited for them? You bet! Now that you know there is a backpack diaper bag out there just for you, how do you go about choosing one? Read on! When you’re searching for the best backpack diaper bag for you and your baby, there are a few features your new bag should have to ensure it is easy to use and lasts for as long as you need it. The way the bag is built will tell you how well it will do for you while you do it. The first thing to look at is the straps, which should be padded and wide so they don’t cut into your shoulders, especially when the bag is full. All the seams should be reinforced so they don’t come apart as you use your backpack. The zippers should also be of high quality, with large teeth, sturdy closures, and tabs that are easy to grab. There are multiple fabrics used to make backpack diaper bags, so you can choose from nylon to polyester to canvas. You may want to choose one that looks great on the outside, with a pattern or color that meets your personal style. But you should also consider how easy this fabric is to clean. Can it be wiped off if a spill happens? Is it machine washable? Can it handle different temperatures? These questions should always be considered before you take any bag home. Most diaper bags come with some sort of folding changing pad, and backpack diaper bags are no exception. This pad should fit nicely into a designated pocket. It should also be made of materials that can be easily wiped clean. When packing for a baby, you’ll likely be packing for all occurrences. You’ll not only need room for diapers, wipes, bottles, toys, and anything else your baby needs, you’ll need space for your belongings as well. Make sure there is a large storage area for bigger items. Then there should be pockets for everything else, to keep it all secure and organized. Zippered pockets are best, to keep your stuff inside the pocket you placed it in. Waterproof pockets are great for creams, liquids, and even soiled diapers and wipes, to ensure a mess doesn’t contaminate everything else in the bag. Insulated pockets are best for bottles and baby food, plus a drink for mom or dad. When it is empty, the bag should be light, to make sure it won’t be too heavy when you pack it up. If the bag is only a pound or so, you won’t have an issue filling it up. Of course, a 3-5 pound bag will be heavy on its own. Adding all your gear to it will make it more difficult to carry, so you won’t want to use it on any long trips. For the grown-up: Cell phone, wallet, snacks, keys, sunscreen, a drink, and sunglasses just to name a few. For the kiddo: Diapers, wipes, extra clothes, blankets, bibs, pacifiers, toys, diaper cream, changing pad, bottles, and formula just to name a few. A bag with plenty of pockets is a great choice for someone who likes to keep everything organized and in its place. Consider how easy it is to use. Think worst-case scenario: If you’re out and have to change baby unexpectedly in a spot that is less than ideal, how easy will it be to access the items you need? You’ll want a bag that has a light colored interior so that you can see where everything is inside. You’ll also want a bag that opens up wide enough for you to easily retrieve what you need. As far as interior pockets go, think zippers. They will give you the best shot of not having a mixed-up disaster to deal with if the bag gets tipped upside-down. No amount of organizational pockets will matter if you’re constantly having to reorganize them because everything falls out. Don’t forget about comfort. This is an especially important factor when you’re looking at backpack diaper bags. All the weight is distributed to your shoulders and back. You’ll want a bag that has cushy, comfortable straps! Now it’s time for the good stuff! We have narrowed down the sea of backpack diaper bags to show you some options that might be what you need. The Ju-Ju-Be diaper bag was designed to be not only comfortable but also very user-friendly. The bag can be carried by the handle and worn over-the-shoulder or as a backpack, which landed it on our list! The straps are made from memory foam and are textured to keep it securely on your shoulders. It has a zippered “mommy” pocket on the outside front for cell phones, keys, and anything else you need. The outside also has insulated pockets on either side and is treated with Teflon fabric protector to keep those stains away. Inside there are four gusseted pockets, three zipper pockets, and a lot of space. The inside is also treated with a natural antimicrobial treatment that prevents the growth of mold, mildew, and stinky bacteria. It includes a comfy memory foam changing pad. To top it all off, the bottom of the bag has luggage feet to keep it from sitting on the dirty ground! The dimensions of this bag are 16.5 x 13.3 x 6.8 inches and it weighs 2.5 pounds. This ultra-roomy diaper bag would be a great choice for a family with twice the baby or toddler items to cart around. Made from high-quality polyester, this bag has twelve pockets of different sizes and an insulated pocket that has enough space for two bottles. It also has small attached straps that allow it to hook right onto a stroller and a pocket specifically designated for baby wipes. There is plenty of space inside for extra clothes and toys for more than one baby! The Bag Nation backpack comes with a changing pad and an extra small bag for whatever little items you want to corral. The dimensions of this bag are 17 x 14 x 7.5 inches and it weighs 2.4 pounds. The lightweight design of this Sleeping Lamb bag would make it a great choice for travel. In addition, it has a whopping sixteen pockets! The fabric is a waterproof polyester that holds up well. One of the more unique features of this bag is the mildew-proof pocket just for pacifiers. There are also a couple of pockets that are designated for wet items, keeping them separate from the things you want to keep dry. This travel backpack is also spacious enough for more than one child’s belongings and includes a changing pad. The stroller straps and notebook pocket are extra features that would also make this bag easy to travel with. The size of the bag is 16.9×7.1×15 inches and it weighs 1.6 pounds. The Wallaroo Diaper Bag Backpack would be a good choice for an all-around everyday bag, but the added wet bag makes it great for cloth diaper users. It comes in black, blue, or purple and has a quilted design. The boxy shape allows for holding a lot of items without feeling like they’ve been lost in a bottomless pit. The fabric is made from is resistant to water and tears. It has four exterior pockets, one with an additional small zipper section for a cell phone or keys. Two of the exterior pockets are also insulated. The interior pocket for the included changing pad can also hold a 15-inch laptop. Loops for the stroller are built into the bag. The dimensions are 17 x 10.9 x 4.9 inches and the weight is 1.4 pounds. 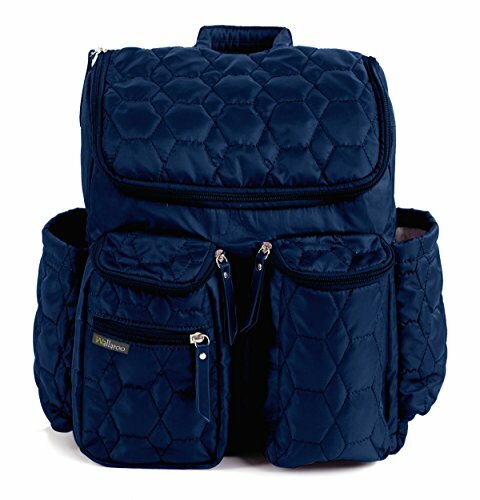 Even with the color choices, the quilted design is geared more toward a female user. For a backpack that isn’t specifically a diaper bag, this ibagbar bag has many features that are necessary for those toting around babies. 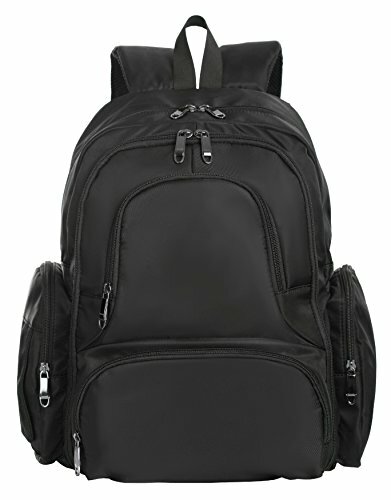 There is a total of nine pockets in this attractive backpack. 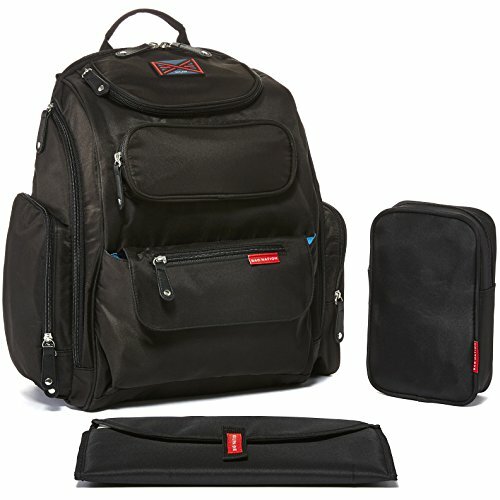 It has two side pockets, four zipper pockets, two interior slip pockets, and a laptop sleeve. This backpack is roomy enough to hold a change of clothes and all the other little trinkets babies require while still holding some of mom or dad’s essentials too. It comes in four neutral colors, each appropriate for a male or female to carry. The dimensions of this bag are 12 x 7 x 18 inches and it weighs 1.7 pounds. There are numerous factors that go into choosing a diaper bag. Ultimately it comes down to the one that fits you, your style, and your lifestyle the best. We’ve highlighted some of the best options out there so let’s recap. 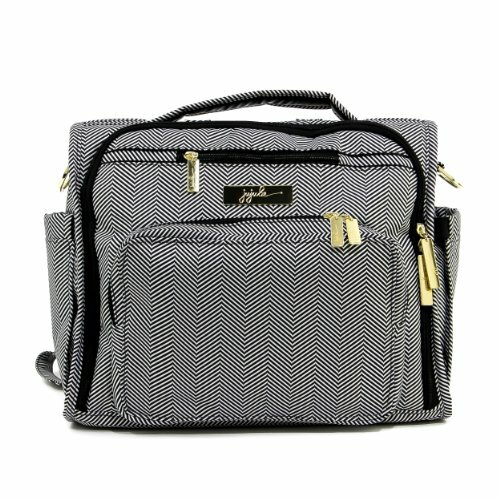 The Ju-Ju-Be Legacy Collection B.F.F Convertible diaper bag really has all the important features you want, wrapped up in one great-looking bag. The Bag Nation backpack diaper bag has less visual pizzazz than some of the diaper bags out there, but what it lacks in form it makes up in function. The Sleeping Lamb travel backpack diaper bag could make your trips, near or far, much easier to organize with its capacity to hold a lot of things, yet remain lightweight and comfortable. If you’re a cloth diaper family, the Wallaroo bag would make an ideal purchase. If a traditional diaper bag just isn’t your thing, the ibagbar backpack would be a great option. It’s attractive, neutral, sturdy, and roomy. Happy shopping! Thank you for visiting MyTinyTraveller.com. If our article has helped you make a decision about the best backpack diaper bag for you, please click through to Amazon using one of our ‘Buy Now’ buttons. We are an Amazon Affiliate website and we keep our website running through the small commission we receive when you purchase your backpack diaper bag from Amazon after visiting our site. There is no extra expense for you – the price is the same as if you went to Amazon directly. If you’re looking for more than the best backpack diaper bag, please review our best stroller buyers guide.